We have an AMAZING DEAL for you!!! The most challenging time of the year to maintain our healthy lifestyles are the days between Thanksgiving and Christmas. 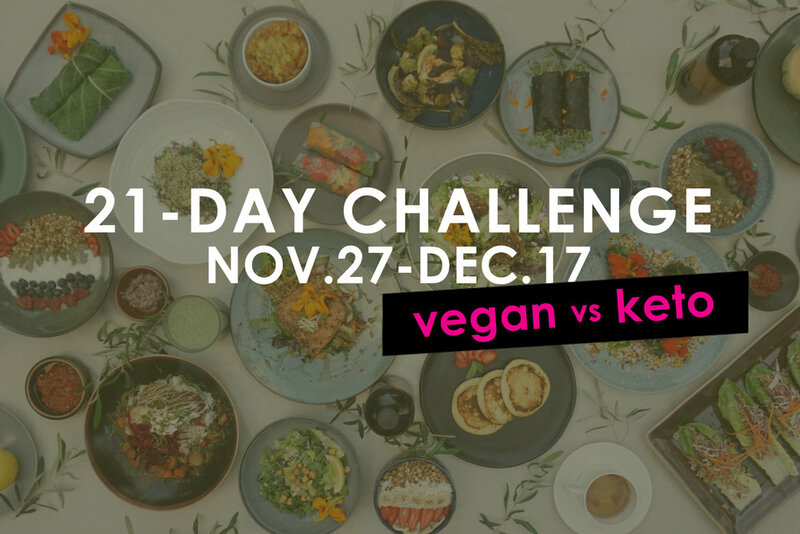 Therefore, in our ongoing research of different health lifestyles, we came up with a pilot program of a 21- DAY CHALLENGE: VEGAN vs. KETO! And the best of all, it's only $21/day for 21 days*!!! And we deliver the meals to you! Standard pricing will be minimum of $45/day, so this is a steal! Meal plans will contain SUPERFOODS and ingredients from LOCAL, SUSTAINABLE, and ORGANIC sources with NO ADDED SUGAR and GLUTEN-FREE. Because of this insanely good deal, we are limiting it to a very few number of adventurous eaters who want to take on this challenge and help us provide feedback in our recipes and services while updating us on your progress. We will check in you to share health tips, prancerising, and motivational support! Please help us during this pilot and sign up now as they are VERY limited!!! Thank you and make a beautiful, happy day! *$21/day for 21 days meal plans are for one person. Sign up with your email address to receive weekly menu updates, news, discounts, special events, and recipes. Thank you! Càm Ón! Gracias! Merci Beaucoup!